It is widely accepted that the conflict between women’s family obligations and professional jobs’ long hours lies at the heart of their stalled advancement. Yet research suggests that this “work–family narrative” is incomplete: men also experience it and nevertheless advance; moreover, organizations’ effort to mitigate it through flexible work policies has not improved women’s advancement prospects and often hurts them. Drawing on a case study of a professional service firm, Professors Robin Ely, Irene Padavic, and Erin M. Reid develop a multilevel theory to explain why organizations are caught in this conundrum. In 2018, New York Times writer Nicholas Kristof, and his wife, former Times writer Sheryl WuDunn (HBS '86), who worked in finance, were planning for their next book. The couple's earlier books had given rise to social movements around gender equity and poverty issues. They hoped the next book would be equally powerful. What should the book focus on? What additional content should they create to make sure their writing had an impact? Women having a heart attack are less likely to die if their doctor is also female, according to a new study by Laura Huang and colleagues. How much less likely? When treated for a heart attack by men, the risk for women goes up 1.5 percent. That means roughly one in 66 women has a better chance of leaving the hospital alive if their doctor is also a woman. Professor Letian (LT) Zhang's new study digs deeper into the conflicting research on whether gender diversity makes a company more productive, asking an important qualifying question: do region and industry have a correlating effect on outcomes? 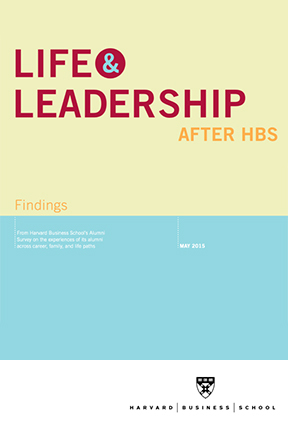 Life & Leadership After HBS is a longitudinal study of the post-MBA paths of Harvard Business School alumni. Study findings have been published in the New York Times, Harvard Business Review, Poets & Quants, and covered in other print, digital, and broadcast media outlets. Life & Leadership examines the role played by race and gender in the life and career outcomes and experiences of alumni. The Gender Initiative hosts an annual Gender & Work Symposium highlighting research and ideas about gender in organizations. Since 2013, more than 100 scholars and practitioners have gathered on campus to share and discuss groundbreaking research and insights across the classroom, industry, and society. The Courage of our Convictions, the 7th annual Gender & Work symposium, will be held on the Harvard Business School campus April 4-5, 2019.